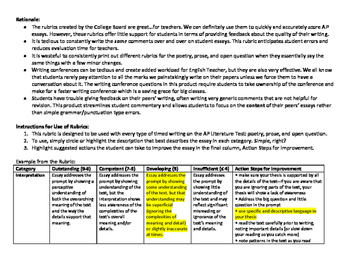 •	The rubrics created by the College Board are great…for teachers. We can definitely use them to quickly and accurately score AP essays. 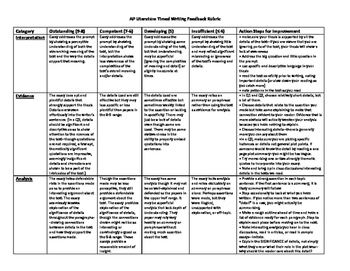 However, these rubrics offer little support for students in terms of providing feedback about the quality of their writing. •	It is tedious to constantly write the same comments over and over on student essays. This rubric anticipates student errors and reduces evaluation time for teachers. •	It is wasteful to consistently print out different rubrics for the poetry, prose, and open question when they essentially say the same things with a few minor changes. •	Writing conferences can be tedious and create added workload for English Teacher, but they are also very effective. We all know that students rarely pay attention to all the marks we painstakingly write on their papers unless we force them to have a conversation about it. 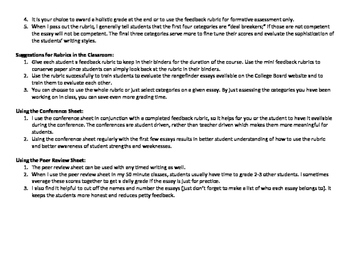 The writing conference questions in this product require students to take ownership of the conference and make for a faster writing conference which is a saving grace for big classes. •	Students have trouble giving feedback on their peers’ writing, often writing very generic comments that are not helpful for revision. This product streamlines student commentary and allows students to focus on the content of their peers’ essays rather than simple grammar/punctuation type errors. 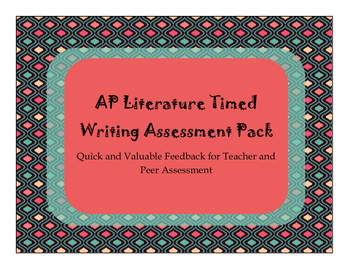 Your purchase includes a detailed timed writing feedback rubric, mini-rubrics, writing conference worksheet, and peer evaluation of AP timed writing worksheet.